The Edimax 5/16-port Fast Ethernet switch is perfect for improving theperformance of small network. This switch satisfies the need for high-qualityproducts at an affordable price - enabling even the most budge-consciousorganizations to trade up to the next level of networking power. This switch supports 10/100Mbps auto-negotiation on all ports, for seamless migration to 100Mbps connections without time-consuming trips to the wiring closet whenever end stations are upgraded to Fast Ethernet. All ports also automatically sense half or full duplex connections for high speed server orswitch-to-switch configurations. This switch is most suited to the following applications : 1. It can be placed near the core of the network to eliminate bottlenecks andimprove the overall network throughput. 2. It can extend the span of a network that has the maximum allowed hubsconnected in series. 3. When used as a desktop connectivity device, it provides the highest possible performance for connecting users to your network. These Fast Ethernet switches' compact and slim design allows direct placing on the desktop or conveniently mounted on the wall or the side of a desk toaccommodate cabling consideration. Every individual port is capable of automatic sensing the connected device's speed (10Mbps or 100Mbps) and duplex(Half or full) mode. It's 100% transparent to users - a truly plug and play device. The full duplex feature can double the network throughput on every port. It is used for high speed server or switch-to-switch connections. The maximum throughput of every port can reach up to 200Mbps! This switch delivers non-blocking performance at full-duplex on all ports. This feature provides full wire speed to the connected devices and greatly increases the network performance. This switch is designed with store and forward architecture that eliminates error packets in the network, improving efficiency. More Product InfoThis 5-Port fast Ethernet switch is perfect for a home or small office network. 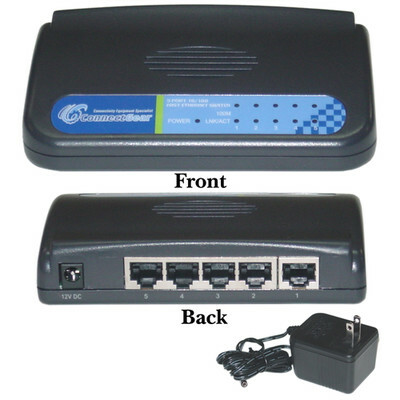 This switch provides your LAN with high-speed, 10/100 Mbps auto-sensing connectivity for as many as 4 users. Just plug in your Ethernet cables, connect a power cord, and you're ready to go there's no software to configure. All ports also automatically sense half or full duplex connections for high-speed server or switch-to-switch configurations. An inexpensive way to add ports to my home network. Easy to set up and use. No crossover cable needed.